Chuck Akre’s portfolio decreased marginally from $5.24B to $5.21B this quarter. A minutely small stake in ANSYS was sold while marginally reducing several other stakes. The top three positions are American Tower, MasterCard, and Markel. Charles Akre’s Akre Capital Management portfolio decreased marginally from $5.24B to $5.21B this quarter. The number of positions decreased from 31 to 30. 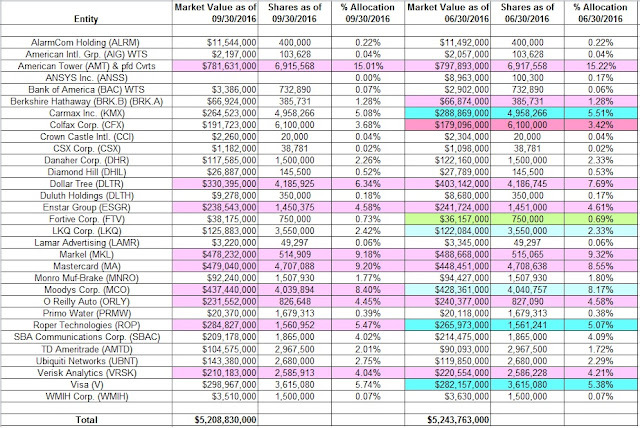 The largest five stakes are American Tower (AMT), MasterCard (MA), Markel Corporation (MKL), Moody’s Corporation (MCO), and Dollar Tree (DLTR) and they together account for ~48% of the total portfolio value. Akre coined the term "compounding machines" to describe the type of businesses he invests in. To learn more about that investing style, check out 100 to 1 in the Stock Market. American Tower (AMT), MasterCard (MA), and Markel Corporation (MKL): American Tower and Markel positions have been in the portfolio for over sixteen years. 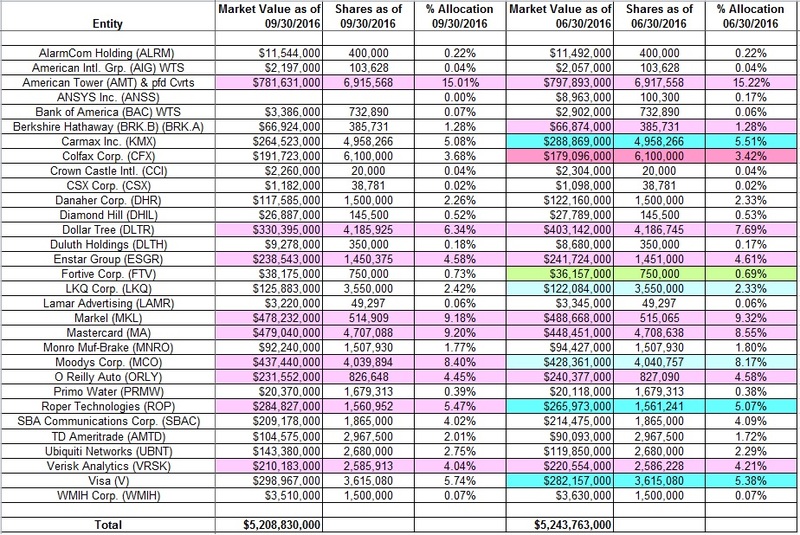 AMT is the largest stake at ~15% while MKL is at ~9.2% of the portfolio. AMT & MKL currently trade at $103 and $885 respectively. The MasterCard position was first purchased in 2010 in the low-20s price-range and it currently trades at ~$104. The stake saw increases every year thru 2015 but has been kept relatively steady YTD. All three positions saw marginal trimming this quarter. Moody’s Corporation (MCO) and Dollar Tree (DLTR): The initial purchase of MCO happened in Q1 & Q2 2012 in the high-30s price-range. Since then, the position has been doubled at higher prices. It currently trades at $100. DLTR was first purchased in 2010 at a cost-basis in the low-20s. The stock currently trades at $87.76. The position has been kept relatively steady so far this year although previous years have seen significant buying. Both stakes saw marginal trimming this quarter. Visa Inc. (V): V is a fairly large 5.74% of the portfolio stake. It was established in Q2 2012 at a cost-basis of around $30. Q2 2013 saw a one-third increase at a cost-basis in the low-40s. Last quarter saw a huge ~58% increase at prices between $73 and $82. The stock is now at ~$79.14. For investors attempting to follow Akre, V is a good option to consider for further research. Roper Technologies (ROP): ROP is a fairly large ~5.5% of the portfolio position first purchased in Q2 & Q3 2014 at prices between $129 and $150. The stake saw incremental buying in the following quarters as well. Last quarter saw another ~19% increase at prices between $165 and $185. The stock is now at $186. There was marginal trimming this quarter. CarMax Inc. (KMX): The ~5% KMX stake is a very long-term position first purchased in 2002. The bulk of the current stake was built over the four quarters thru Q2 2016 at prices between $42 and $68. The stock is now at ~$62.80. Colfax Corp. (CFX): The medium-sized 3.68% CFX position was first purchased in Q3 2012 and built up over the last four years at prices between $20 and $75. Last quarter saw an about-turn: ~20% reduction at prices between $25 and $34. The stock is now at $39.21.